I don’t do horror or haunted houses. The last scary movie I watched was Children of the Corn in sixth grade. So when I got the assignment to do Ruby Falls’ Haunted Cavern, I was nervous. Buzzfeed named it fourth on their list of “terrifying haunted houses to see before you die.” That&apos;s in the country, not just Chattanooga haunted houses! There’s plenty of non-horrifying fun to be had at Ruby Falls. Fall is the perfect time to do their High Point ZIP Adventure at Ruby Falls – a combination of zip lines and ropes courses – and the cave is open daily 8am – 8pm for waterfall tours. This year’s haunt moved to a new location in Lookout Valley, to a 29,000-square-foot building to the town of “Dread Hollow.” It’s a town doomed by its past, where evil still lurks in the dark. 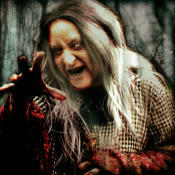 Mercy Harker (who is a witch) has cast a spell on Dread Hollow and waits to trap those who enter. The 7-year-old girl I spotted in line made me feel slightly braver (and wonder about her parents). This is NOT advertised as a family attraction, but Ruby Falls doesn’t set a minimum age and leaves the decision up to the parents. We begin the evening in the lobby, catching up with two of the haunt’s creators Tim Green and Todd Patton. The duo has been in the scare business virtually all their lives. Patton moved here to open a Halloween store several years ago, and Green has been running haunted houses since 7th grade. What sets the Haunted Cavern apart is the elaborate storyline, which Green and Patton have been crafting for months. “I love the feeling of being scared and I love scaring others. It’s a miracle my mother is still alive,” jokes Green. About that time, a car rolls through the parking lot with an “ISCAREU” Ohio license plate. People come from all over, and last year they scared the wits out of thousands! This year they are offering a R.I.P. Fast Pass for those who want to avoid wait times. 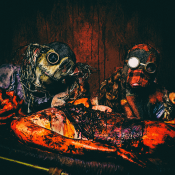 The attraction opens at 7 p.m. Thursdays – Sundays in October and there are creepy creatures called “sliders” who glide over the asphalt in what must be metal kneepads, causing a terrifying grinding noise and sparks. They keep the groups who enter small to intensify the experience. At this point I’m extremely glad I’m not going first. I clutch my husband’s arm and don’t let go for the rest of the time we’re in Dread Hollow. 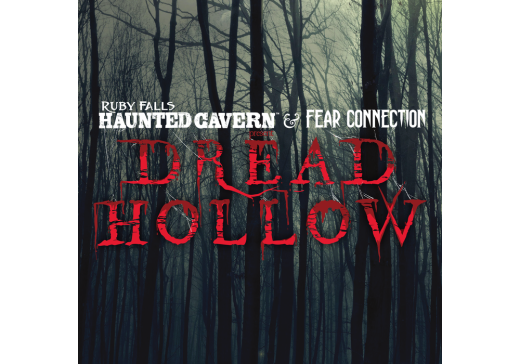 While there were plenty of people jumping out at us, Dread Hollow goes beyond the typical “Boo!” tricks. 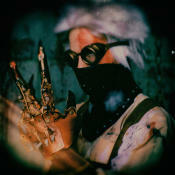 It excels as a haunt that’s equal parts creepy, gory and terrifying; achieved with professional makeup, sets and actors. In a world filled with horrifying things, I can almost see why people are drawn to something that can scare but never really hurt you. On the way out I ran into the 7-year-old and asked if she was afraid. “No, not really,” she replied matter-of-factly.